After listening to an anonymous phone call, Bud finds the case becoming more complex than a simple homicide. And as they unravel the mystery of the dead, his officers move closer to a confrontation with NCIS. Crazy Charlie, and drug runners who may have connections to the Middle East. When the dust settles, Bud is left with a new homicide to solve, a suspicion that a mole is hiding in NCIS, and an unpaid debt to a man who doesn’t officially exist––the mysterious Stone Fly. Excellent read you won’t want to put it down. The setting is in a part of Oregon that I am very familiar with which makes it very interesting. This was the first Bud Blair book I read and intend to read others. It is well crafted for tension and conflict, well developed characters–quite a few at the start but we get to know them well, and realistic dialogue. Rarely these days do I find a perfect book from a relatively new author. This one is perfect. Good news, Bud Blair is back. Even if you didn’t get to know and like him in Spider Silk, you’re not going to want to miss him in Stone Fly. 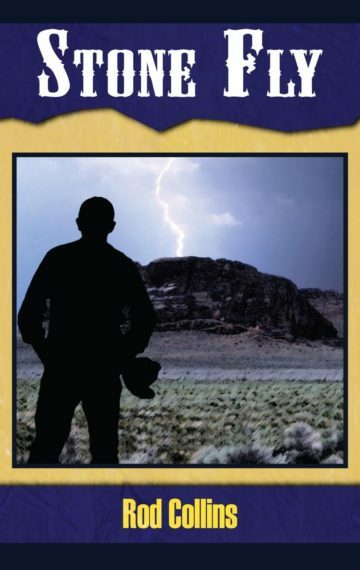 Collins delivers again with a nicely crafted tail of adventure and mystery in the high dessert. Put this one in your beach bag and relax in the sun with a cool thriller. The story centers around Sheriff Bud Blair, his small high desert town, and the highway that is a prominent component of the area. Suddenly it has become the main artery for illegal traffic, knowledge of which the sheriff gains only in an unofficial manner. However, it gradually involves him, all of his personnel, that of associated county sheriffs, and the state police, as well as residents of the area. It expands even further with involvement of detectives and a lawyer from Seattle, and the Departments of Home Security, the FBI, NCIS and associated persons. The author has written an interesting thriller with a large cast of characters, almost all of whom are important to the story and many of whom would provide an interesting protagonist in his/her own right. The action really is too involved to single out any particular story line. Suffice it to say if you like action that is believable, you’ll enjoy Stone Fly.